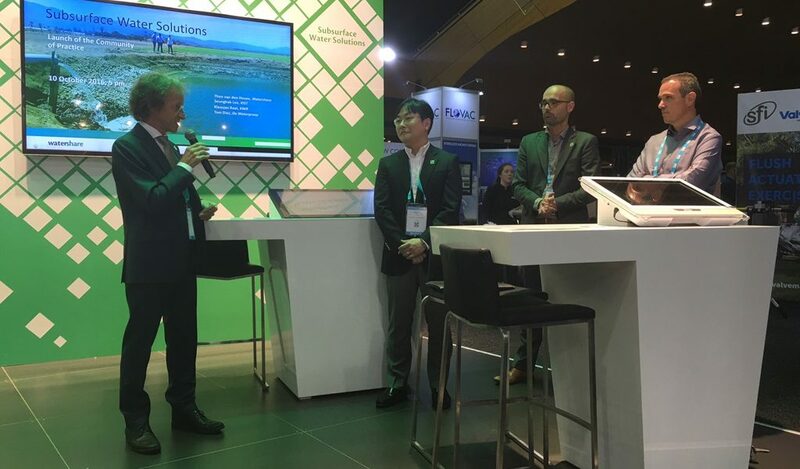 Watershare’s Subsurface Water Solutions Community of Practice was launched today at the IWA World Water Congress & Exhibition in Brisbane. Watershare partners – including KIST (South Korea), Victoria (Mexico), De Watergroep (end-user in Belgium), and KWR (Netherlands) – collaborate in this community on innovative, practical concepts for advanced freshwater management, with the objective of protecting, recharging and sustainably exploiting groundwater resources. Subsurface Water Solutions (SWS) build on experiences with Managed Aquifer Recharge (MAR) and Aquifer Storage and Recovery (ASR), but SWS applications are much wider thanks to their incorporation of innovations in water well design and groundwater modelling and management. Subsurface Water Solutions introduce a new thinking into water management and provide practical answers for freshwater challenges faced by farmers, utilities, industry and cities. These answers are showcased in the Community of Practice’s application references. Take for example the Dinteloord ASR and reuse application reference in the Netherlands. Industrial reuse water is made available to greenhouse farmers following its storage in and recovery from a brackish groundwater aquifer. The ASR overcomes the time lag between the period (September–January) when the freshwater is available from a sugar factory, and the period (March–August) when the nearby greenhouse farmers need it to meet their irrigation needs. The Clean Subsurface Reservoir in Korea is another Watershare application reference. Drinking water is temporally stored underground to be recovered when public water demand is high. Watershare members collaborate by exchanging knowledge and expertise on water-soil interactions, thereby achieving better predictions of changes in the quality of the water during its storage. This helps practitioners set up the ASR system in such a way that the recovered water can be distributed directly to the public, without any additional post-recovery treatment. Subsurface Water Solutions is one of the current five Community of Practices within Watershare, the international knowledge management model in which experts from leading institutes share their knowledge and expertise. Watershare’s ambition is to make the most appealing and effective knowledge and expertise internationally available to water practice. Thanks to Watershare, knowledge institutes are able to better serve their end-users – water utilities, water managers, municipalities, farmers and industries – thereby placing these organisations and individuals in a stronger position to solve local and national water issues.